This morning of coffee and crosswords will include an overview of crossword history, introduce the basic principles of American crossword puzzle construction, and peek behind the scenes at the New York Times and the puzzles of the annual American Crossword Puzzle Tournament. Crossword puzzle guidelines will be available for solvers curious about construction. Bring all your puzzle questions, and let’s solve together. Guaranteed to build mental muscle! 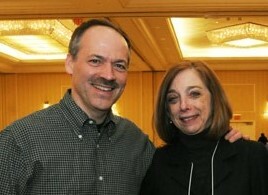 Michelle Arnot, author of Crossword Puzzles for Dummies and Four-Letter Words: Secrets of a Crossword Insider, serves as an official at the annual American Crossword Puzzle Tournament, organized by NPR’s puzzle master, Will Shortz. While living in Tokyo she met the puzzle people who sparked the Sudoku craze. Michelle and her husband, Roger Brown, have been Sandisfield homeowners since 1980.